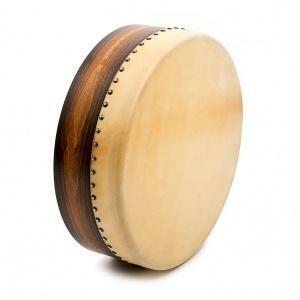 The TrHED is, as the name suggests, a more 'traditional' bodhrán. 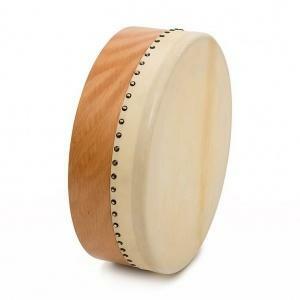 The TrHED has a clear role model in the sound character and the basic design: the legendary Charlie Byrne bodhrán. Charlie Byrne, now sadly deceased, was perhaps the first famous professional bodhrán maker. 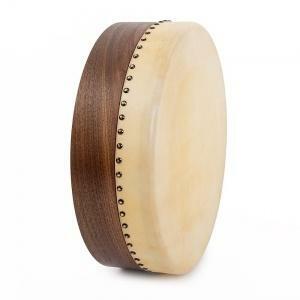 He had strong influence in the development of the bodhrán and had characterized the 'typical bodhrán sound' of old recordings, for example De Danann. The TrHED has its origins in many years of close cooperation with Johnny “Ringo” McDonagh, an institution in the world of Irish Trad, a legend and an idol in the traditional bodhrán world. Ringo prefers large diameters, relatively narrow frames, and thick skins from old, male goats. The often easily recognizable, wide spine divides the surface into about two thirds and one third, which is used for certain sound effects. The sound when you hit the spine is considerably harder and louder, and also, the areas to the left and to the right of the spine sound different. That is why the player can use different stroke positions to create different sounds without moving the skin hand. Over the years, and influenced by other musicians, the TrHED was further refined, and now presents itself in a mature and contemporary, but still fully traditional design. The TrHED would just tie here and make the 'old sound' again a bit more attractive and available. Instead of the usual black tape around the skin edge a 'Transparent tape' is used. It is a special coating used at the interior and exterior of the drum skin and works in a similar way as the black tape. In the right hands it is a fantastic instrument with a bourdon-like bass, crisp and dry attack, and a earthy, almost hypnotic overall sound ! Tool-less 10-point tuning system. Smooth-running and made for low-tention-tuning. Even at low tention the adjusters will not loosen themself. Frame made of beech natural finish / beech brown with sunburst or walnut. Transparent tape" coating (instead of usual black tape) for more harmonic overtone behaviour. The drum skins used here are very rare, so delivery time might be longer than usual for this model. I try to keep this walnut version in stock, the other two models can be pre-ordered and are produced within 3-6 months after your order.